Address: Suite 2030, 300 - 5th Ave. S.W. Blue Mountain Energy Ltd. is a full cycle exploration and development company, primarily focused on exploring for natural gas in the Peace River Arch and west-central Alberta. During the spring of 2002, Blue Mountain Energy Ltd. announced that it had reorganized the corporation, bringing in a new management team and raising $23 million in equity, of which management and directors contributed $3 million, for the purpose of exploring for oil and natural gas. Shortly thereafter, Blue Mountain Energy Ltd. announced that it was offering to acquire the shares of Bolt Energy Ltd. The acquisition was finalized in September 2002 and the entire staff of Bolt Energy Ltd. joined Blue Mountain Energy Ltd. The combined entity provided skilled management and technical expertise, a production base of approximately 680 barrels of oil equivalent per day, an undeveloped land base and numerous drilling prospects. Since the reorganization, Blue Mountain Energy Ltd. has drilled 38 wells and increased production in excess of 2,400 barrels of oil equivalent per day, of which approximately 80% is natural gas and associated natural gas liquids. The Dunvegan prospect is located approximately 105 miles north of Grande Prairie. Blue Mountain has a 68 percent working interest in six contiguous sections (2,606 net acres) of land and one producing Kiskatinaw gas well in the Dunvegan prospect area. Facilities and pipelines were built in the third and fourth quarter of 2003, and the 11-14 well commenced production on November 8, 2003. The Company feels it is prudent to initially produce the well at 8 mmcf/d (5.4 mmcf/d or 900 boe/d net) of raw gas, with the capability of producing at much higher rates if considered appropriate. 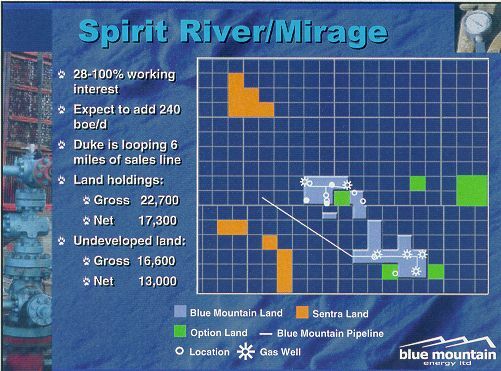 Blue Mountain has an average 60 percent working interest in and operates eight sections (3,072 net acres) of undeveloped land at Spirit River. The Company also earned a net 33 percent working interest in two additional sections with the drilling of a farm-in well at 15-14-78-7W6. Spirit River is located approximately 40 miles north of Grande Prairie. 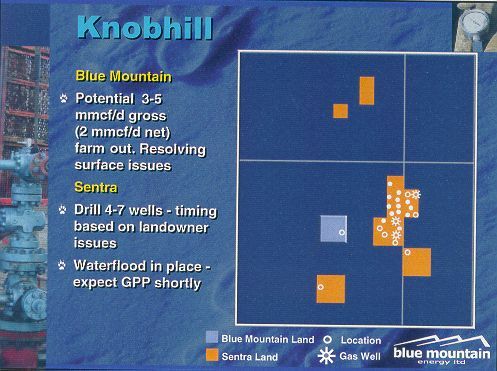 Blue Mountain plans to be active in the area during the remainder of 2004 with the drilling of one or two new wells. Blue Mountain holds interests in 16,000 gross acres (12,800 net acres) of land and two producing Gething gas well at Dixonville, which is located approximately 40 miles northwest of Peace River. This producing property was acquired as part of the Bolt transaction, and Blue Mountain is actively evaluating the prospect for exploration opportunities. Production from the Dixonville property averaged 240 mcf/d of natural gas for month of November 2003, compared to 118 mcf/d of natural gas for the first three quarters of 2003 due to the successful re-completion of the well at 5-22-88-1W6. Blue Mountain has an average working interest of 59 percent in four sections (1,511 net acres) of land at Ferrybank. The 100 percent working interest shut-in well at 7-23-45-27W4 was re-completed and brought on-stream in January 2003. There was no production from these lands in 2002. In the third quarter of 2003, production from the Ferrybank property averaged 2 mmcf/d of natural gas and 33 bbls/d of natural gas liquids. Blue Mountain holds an average working interest of 71 percent in six sections (2,715 net acres) of land and three producing gas wells. Westerose is located approximately 60 miles south of Edmonton. 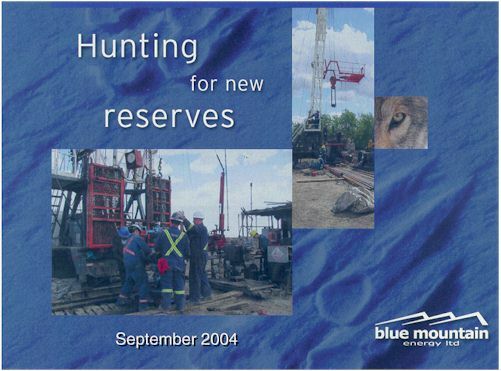 In May 2003, Blue Mountain acquired its partner's 50 percent working interest in four sections of land to the base of the Belly River and two producing gas wells to increase its interest to 100 percent. Blue Mountain operates and has an average 55 percent working interest in 2.6 sections (927 net acres) of land at Markerville. Markerville is located approximately 30 miles southwest of Red Deer. This multi-zone area has production of natural gas in shallow gas sands at 500 metres down to Mississippian limestone at 2,000 metres and oil production from the Cardium zone at 1,800 metres. Lands in this area constantly turn over, with a mixture of Crown and freehold available for acquisition. These highly prospective characteristics make this property an active prospecting area for Blue Mountain. On September 30, 2004, Blue Mountain Energy Ltd. and Sentra Resources Corporation ("Sentra") announced that they have completed their previously announced statutory plan of arrangement (the "Arrangement") pursuant to which Sentra and Blue Mountain combined their businesses and operations, with the merged company continuing under the name of Blue Mountain Energy Ltd. The Arrangement was approved by 100% of the securityholders of Sentra who voted at the special meeting of the securityholders of Sentra held on September 30, 2004. The final order of the Court of Queens' Bench of Alberta approving the Arrangement was also granted on September 30, 2004. Key prospects available for immediate drilling, including low-risk Belly River waterflood project at Knobhill, Alberta. Projects of Sentra Resources Corporation include Spirit River / Mirage, Valhalla and Woking in Peace River Arch Area, Rigel in B.C., Knobhill project in West Central Alberta. Mr. Pawliw received a Bachelor of Science degree in Mechanical Engineering from the University of Saskatchewan in 1972. After obtaining his degree, Mr. Pawliw commenced full-time employment in 1972, with Amoco Petroleum Corp. in Edmonton, Fort McMurray and Calgary, as a production engineer and then joined Bow Valley Exploration Ltd. in 1974, in a similar capacity, advancing to Onshore Operations Manager. From 1978 to 1997, Mr. Pawliw was a co-founder, President and director of Cimarron Petroleum Ltd., an oil and gas exploration company which was listed on The Toronto Stock Exchange. In 1997, Newport Petroleum Ltd. acquired Cimarron Petroleum Ltd., where Mr. Pawliw remained as a director for one year thereafter. Mr. Joynt graduated with honours from the faculty of Business Administration at Mount Royal College in 1987, and received his Certified Management Accountant (CMA) designation in 1989. He began his career in the oil and gas industry with Imperial Oil Ltd., where he held various positions while advancing through the company's Accountant Development Program. Mr. Joynt was subsequently promoted into management and remained with the company until 1993, when he joined Cimarron Petroleum Ltd., a public company trading on the Toronto Stock Exchange, as Senior Financial Accountant. Mr. Joynt remained with Cimarron Petroleum Ltd. until early 1997, when the company was purchased by Newport Petroleum Corporation, at which time he joined Maxwell Oil & Gas Ltd., a public company trading on a predecessor exchange to the TSX Venture, as Controller. From 1998 to 2002, Mr. Joynt was employed as Controller of Richland Petroleum Corporation, a public company trading on the Toronto Stock Exchange. Mr. Chiarastella is a Mount Royal College Graduate and has 23 years of oil and gas experience. As co-founder and President of Bolt Energy Ltd., he was responsible for the ongoing business of the corporation, identification and evaluation of investment opportunities and supervision of activities. Mr. Chiarastella also co-founded and held the position of President with Burner Exploration Ltd. which was founded in June of 1993 and was later listed on the Alberta Stock Exchange. Prior thereto, he held positions as Manager of Land, Manager of Exploration and Vice-President of Remington Energy Ltd. from September 1988 to June 1993 and previous to that was Landman with several oil and gas companies: Chevron Standard Limited, October 1977 to August 1979; Petro-Canada Exploration Ltd., August 1979 to June 1980; Aquitaine/Canterra, June 1980 to September 1988. Over his career, Mr. Chiarastella has been instrumental in negotiating, coordinating and creating what led to significant discoveries in the following areas: Tracy Mountain (North Dakota), Sturgeon Lake, Alberta, Rainbow Lake, Zama, Caroline, Sikanni, Grand Forks, Pouce Coupe and Moose Mountain. Blue Mountain Energy Inc. is one of the few true exploration companies in the Canadian energy sector. The Company is focused on growth through drilling, with exposure to medium-risk exploration. Production rate rose from zero to more than 4,500 boe/d. Most importantly, majority of the Board of Directors are independent and each has significant investment in the Company. On December 21, 2004, Blue Mountain Energy Ltd. announced that it plans to spend $40 million on capital expenditures in 2005. The capital program will consist of $15 million in drilling and completion expenditures, $6millin in equipment, flow line and facility expenditures, $5 million in asset acquisitions, $5 million in land acquisitions and seismic activity, $8 million on work in progress and $1 million on miscellaneous capital costs. The capital program includes 45 wells and will be financed with cash flow and bank debt. 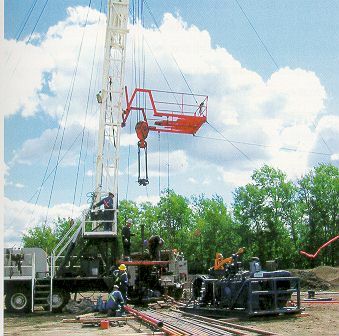 In the first quarter of 2005, the Company anticipates drilling in excess of twenty wells. The record activity levels being experienced throughout the industry are creating a number of shortages which may inhibit their ability to drill all of these wells in the first quarter, but the Company is making every effort to achieve that goal. The first quarter drilling should see 11 of the wells being drilled in the Peace River Arch, 4 in NE BC, and 5 in West Central Alberta. On December 15, 2004, Blue Mountain Energy Ltd. announced that it has completed its previously announced private placement of 1.0 million common shares at a price of $8.25 per share and 500,000 flow-through common shares at a price of $10.60 per share for total gross proceeds of $13.6 million. Proceeds from this offering will be used to fund Blue Mountain's on-going exploration and development activities and for general corporate purposes. On November 29, 2004, Blue Mountain Energy Ltd. announced that it has entered into a bought deal financing agreement with a syndicate of underwriters led by FirstEnergy Capital Corp. and including First Associates Investments Inc. and GMP Securities Ltd. to issue 1.0 million common shares at a price of $8.25 per share and 500,000 flow-through common shares at a price of $10.60 per share on a private placement basis for total gross proceeds of $13,500,000. Proceeds from this offering will be used to fund Blue Mountain's on-going exploration and development activities and for generate corporate purposes. On November 11, 2004, Blue Mountain Energy Ltd. announced their financial and operating results for the nine months ended September 30, 2004. The third quarter has been an extremely active quarter, with the closing of the acquisition of Sentra Resources Corporation on the last day of the quarter and the drilling of fourteen wells during the quarter. Incremental results of operations and cash flow attributable to the acquisition of Sentra will be reflected beginning October 01, 2004. While production has increased slightly in the third quarter to 1,975 boe per day from 1,808 boe per day in the second quarter, the Company expects a significant jump in their production at the end of the fourth quarter, subject to operational deadlines being met. In summary, if the six-inch line loop being constructed by Duke Energy Field Services Canada at Spirit River is completed by year-end, the Company should exit the year above 4,000 boe per day. Copyright (c) 2000 - 2005 Chinese Investment Club Inc.